Inspiration comes in many forms; literally meaning "breathed upon" - Also, divine guidance or influence exerted directly on the mind and soul of humankind. It's a new dawn, it's a new day, it's a new life! Both of these jars were sent to me from The Lettered Cottage. They make great gifts for anyone on your list who might need some good or a bit of being "breathed upon" 365 days a year! Each jar has a daily quote to draw from. Do you need some good inspiration? Love these! The Lettered Cottage is a wonderful site, full of inspiration & positive posts! That's a great idea! A friend and her husband observe the traditional gifts for their wedding anniversary. This year they celebrated their tenth - and the gift was tin. She took a tin container and filled it with 365 memories from their years together. Creativity abounds in the world! That is really cute idea. I once put notes of inspiration in my friend's pockets of all her suit pockets (without her knowing). She was laughing for weeks about it. Love it! Fun! I love the quote of mother Theresa, sometimes we are so busy with our own things that we forgot to smile to the people around us. At times I try and channel my imaginative muse for inspiration. I also listen to music, as that is an inspirational spark. I also live with my eyes wide open for inspiration. I love the whole idea of these (and the look)! 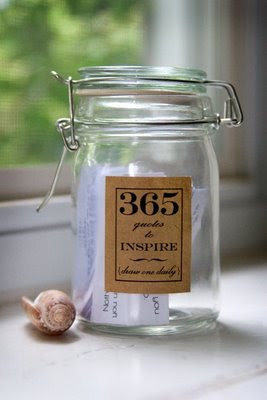 I love inspiration jars! The day I moved to CA, my grandmother gave me one filled with inspiring handwritten notes. I cherish this very special gift. Loved the reminder of the word inspire. To breathe life into life, to create, it's where the magic is. Your blog reminds me of that every day. And I think women supporting each other to become their dreams is divine guidance. what a wonderful air-loom. I hope you'll post it on your blog. just think if we all had our job like that how much better our day would be! we were blessed to have such strong women provide us with daily inspiration. I know our draw from your family and flowers. Have a great day! Great idea I love it.Love the Mother Theresa quote, people rarely smile here and I find myself scrowl now. Not anymore! This is such a great idea! I could even see doing this as a gift for a friend's birthday... the wheels are turning. ingenious idea! i'll for sure check the site. Oh my gosh, love this!!! I'm just now catching up on my reading and had to say this is fab. I did something like this (but not as elaborate) for my husband's Christmas gift a few years ago. He's still saved several of the tiny papers that came in the jar. A unique and lovely gift. I think this is the type of present you give to the special people in your life or all the people who would appreciate it.